We invite you aboard to help us promote green boating! Become a member of Georgia Strait Alliance. Our members are the heart of our efforts to protect and restore the Strait, so that we can all enjoy these magnificent cruising waters for generations to come! Take the Pledge! Get helpful tips on how to protect the environment when you are boating, fishing, diving, paddling, or enjoying our coastal waters in other ways. Ask your marina to join Clean Marine BC, our voluntary marina eco-certification program. Host a green boating presentation or workshop. We’d be happy to come talk to you at your marina or club. 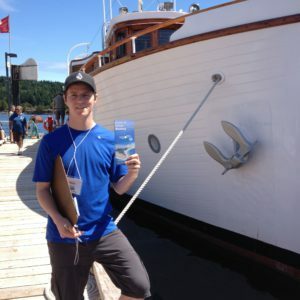 We’d also be happy to provide bulk copies of our Guide to Green Boating for your distribution. Printed materials and displays are also available for rendezvous and other boating events. Email or call us at 250.753.3459. Join us at an event in your community. Volunteer to help out at a boat show or other community event where Georgia Strait Alliance is participating with an information booth or workshop. Purchase a Salish Sea Pilot with partial proceeds supporting our marine conservation efforts! Explore boating issues and solutions to find creative ways to improve upon your green boating practices.